Pano Karatassos swears that the massive meal he’s thrown together on a random Tuesday is simply “homestyle food that you would find at a Greek household.” Perhaps, but Karatassos also happens to be Atlanta restaurant royalty, the namesake scion of a culinary icon and, as the family member who helms the wildly popular Kyma in Buckhead, a legend in his own right. In this particular Greek household, therefore, a feast fit for the gods is kind of the norm. There are so many dishes landing on Karatassos’s kitchen table that it’s hard to keep track. It’s especially dizzying because each is more seductive than the one before. The whole braised fish wearing a scale-like blanket of tomato slices sure is a beauty, but wait ’til you lay eyes on the perfectly coiled phyllo pie stuffed with lamb, resting upon a fat spiral of thick Greek yogurt and topped with a frilly herb salad! 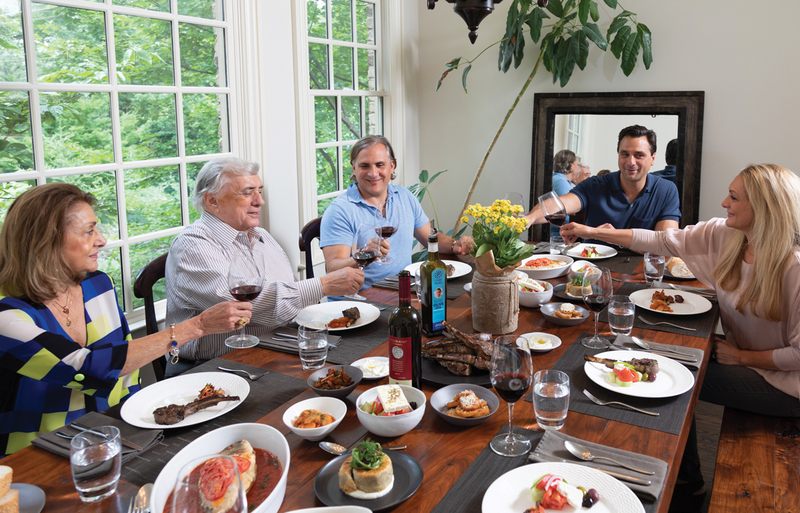 Karatassos’s father, who founded the Buckhead Life restaurant group (ahem, dynasty) back in 1979 with Pano’s & Paul’s, holds court this early evening, flanked by his wife, Georgia, of 55 years and their two other children: younger son, Niko, and daughter, Anne. The patriarch gives a nod of approval as his elder son arranges the grandiose spread. You might not be so fortunate to have a Greek household of your own, but you can do your best to pretend. All of the dishes Karatassos serves at home show up in his luscious, newly published cookbook, Modern Greek Cooking. One of his favorite dishes is a humble one: braised giant white beans with tomato sauce, caramelized onions, and extra-virgin olive oil (aka gigantes plaki), which he fell in love with on Santorini. Pro tip: They’re just as good cold for lunch, so make a big batch.